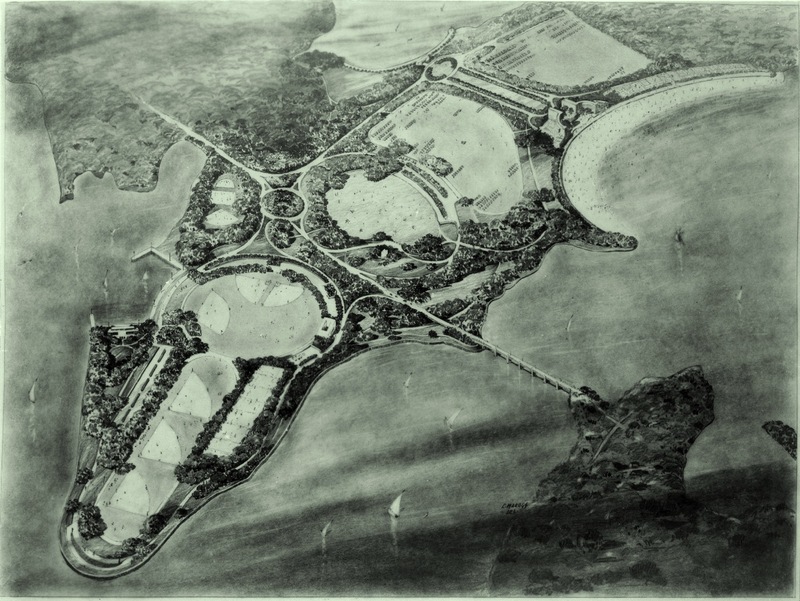 Bird’s eye view of Orchard Beach and Pelham Bay Park, c. 1936. Michael Rapuano, landscape architect; rendering by E. Marugg. Courtesy City of New York Parks and Recreation. In 2012, Thomas Campanella was awarded a Mid-Career Grant to support the writing and production of a book about the American landscape architects Gilmore D. Clarke and Michael Rapuano. The book—Designing the American Century—will be published by Yale University Press in 2014. It is intended to fill a major gap in the historiography of American landscape architecture, which has largely ignored the generation of public-works designers who bridged the well-documented “Country Place” and Modernist eras. It will augment our understanding of the Robert Moses era in New York by demonstrating that Moses, while a brilliant administrator, was enabled by a gifted cadre of designers like Clarke and Rapuano, from whom he often borrowed formative ideas about the design of cities. The book will also help put Clarke and Rapuano’s many parks and public works—some of which have already been lost or comprised—on the radar screen of the preservation and conservation communities. Clarke and Rapuano were conservative designers, educated in the Beaux-Arts tradition and skeptical of modernism. But they practiced at the edge of modernity, bringing art to infrastructure and moving fluidly between the fields of planning, design and engineering. Their parkways in Westchester County, New York were the first modern highways in the world—green corridors used to tie together the vast Westchester County Park System, first regional landscape of the motor age. They were also responsible for scores of parks and playgrounds in New York City, including Orchard Beach, Randall’s Island, Battery, Cadman Plaza, Astoria, Marine and Jacob Riis Parks, the Brooklyn War Memorial and the Central Park Zoo and Conservatory.